Portable Readers » Dani Data Systems India Pvt. Ltd.
RFID UHF Readers (Model No.UHR – 321209) are stand alone mid/ long range UHF readers. They are battery operated OFF line readers for applications where ON Line connectivity or synchronization with cloud based software is not required. They are very convenient and for applications like inventory, asset tracking, searching etc. The OFF line data is transferred to PC anytime or at regular intervals by connecting reader to USB port of PC. 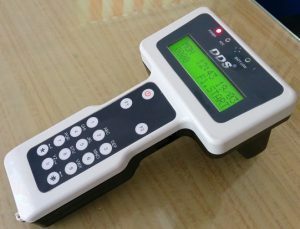 DDS “Plug & Play” software detects the reader on the USB port and automatically transfers the data to PC in excel/ CSV format. Our “Cloud Plug & Play” software transforms to IoT by transferring data to the cloud. This simple, cost effective RFID UHF Reader is suitable from POC (proof of concept ) to full IoT project implementation. The RFID “UHB – 411220” Bluetooth® UHF Reader is designed to read and write to EPC Class 1 Gen 2 (ISO18000-6C) UHF transponders and communicate with any Android phone version 5.0 and above via Bluetooth® wireless technology. UHB- 411220 gives user the highest levels of performance, flexibility and simplicity of operation currently available in market today. The free Android app is preloaded with all ready to use functions for data collection including inventory by location, searching and exporting to excel format. This saves time and resources for Android application development. UHB- 411220 comes with a mobile holder. The RFID “URW – 321209” Desktop UHF Reader/ writer is designed to read and write to EPC Class 1 Gen 2 (ISO18000-6C) UHF transponders and communicate with PC or Cloud software. URW- 321209 gives user the highest levels of performance, flexibility and simplicity of operation currently available in market today. Our free SDK and with 1 met read range of URW – 321209, one can develop any RFID application in no time. 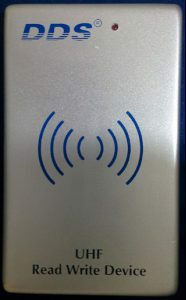 With our ‘UHF Card Reader’ software, RFID tags can be initialized in any cloud software with ease.